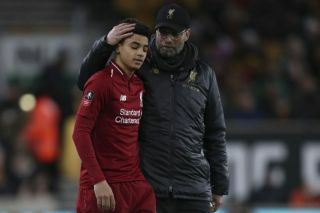 Liverpool were forced into an early change in their FA Cup clash with Wolves on Monday, with Dejan Lovren limping off with a hamstring injury. With Joe Gomez and Joel Matip still sidelined with issues of their own, it wasn’t what Reds boss Jurgen Klopp needed, but it did result in a bit of club history. As noted in the tweet below, 16-year-old starlet Ki-Jana Hoever came on to make his debut for the Merseyside giants, and in doing so, he became the youngest ever Liverpool player to appear for them in the FA Cup. Further, he is the third youngest player ever to feature for the Reds, as he looks to make an early impression and prove capable of making an impact at senior level in the coming months and years. Time will tell if he is able to do so, but ultimately he’ll gain a lot from the experience and will undoubtedly look to improve and develop his game moving forward. Having arrived from Ajax last summer, the Dutch starlet evidently has had the right guidance in his career thus far, and it will be down to Liverpool to develop his talent and ensure that his appearance at Molineux becomes a memorable moment if he goes on to become an important figure for the club. Unfortunately for the visitors, it didn’t get off to the best of starts, with Raul Jimenez giving the hosts the lead in the FA Cup tie before half time as they pounced on a James Milner error to break the deadlock.